Twenty six liters of juice was made from primarily carrots and cucumbers approximately 15 pounds of each. Additionally added was some basil, dill, and a few tomatoes. The carrot tops were also utilized. The cooked strained product was pressure canned at 15 PSI for 15 minutes for long term storage. Annotated pictures depict the process. 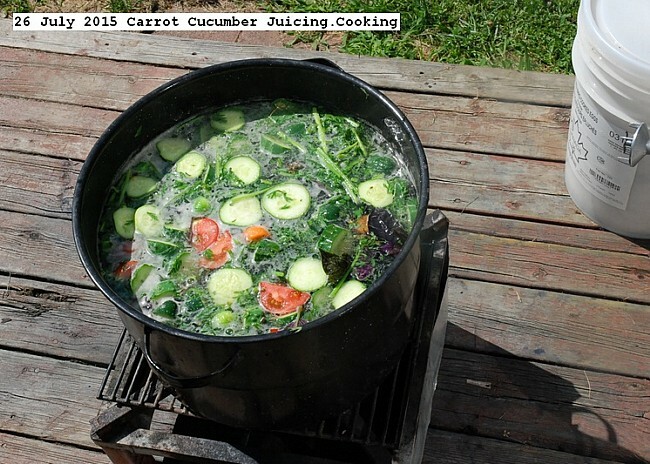 This entry was posted in Uncategorized and tagged Carrot Cucumber Juicing. Bookmark the permalink.